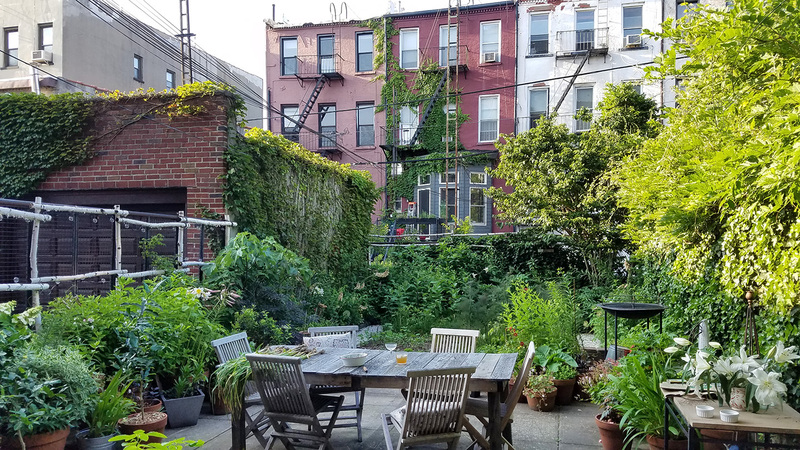 I skipped so many spring blog posts of the garden (tagged on Instagram as #1stPlaceBK) that I realized I'd better post something early summerish before August. It's not for lack of interest. I am just perpetually five items behind on my To Do list, and blogging comes very last, right now. It's an indulgence, timewise, which I miss. Today I managed to cross off bottling seven quarts of linden flower, elder and honeysuckle cordials, two quarts of flower vinegars, processing 10 lbs of serviceberries, staking 27 lilies (how is that possible?) and the tall nicotianas before a big storm front hit, and building a small bamboo trellis for the scarlet runner beans I planted (with hummingbirds in mind). Still five items behind. So I'm blogging. That was not on the list. Early summer and the oakleaf hydrangea (above, center) is in full bloom, with the bees ecstatic about it. Honeybees and carpenter bees visit and can barely stagger away with their fat pollen sacs. The hostas have begun to flower. 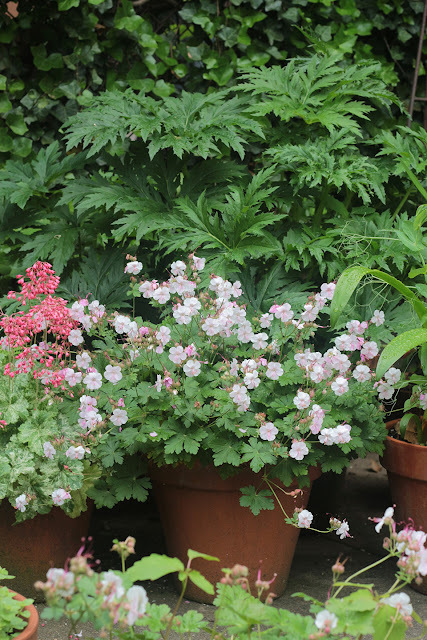 Their crisp, sculptural leaves are a lifesaver in the pots close to the house, where they receive some sun in the mornings in midsummer, but none later and earlier in the year. One plant of Geranium x cantabrigiense 'Biokovo,' dating back to the Harlem terrace, has now filled five pots. It spreads quickly and is a very good filler for semi shady spots. It flowers prolifically from mid May to mid June. Beside it is a small-leafed Heuchera, which might be Heuchera sanguinea 'Snow Storm.' Behind them are Ligularia japonica, whose huge leaves add interest to the tricky western side of the garden dominated by the ivy wall. Very shady until late in the day when the western sun gives these pots a blast for an hour or two. 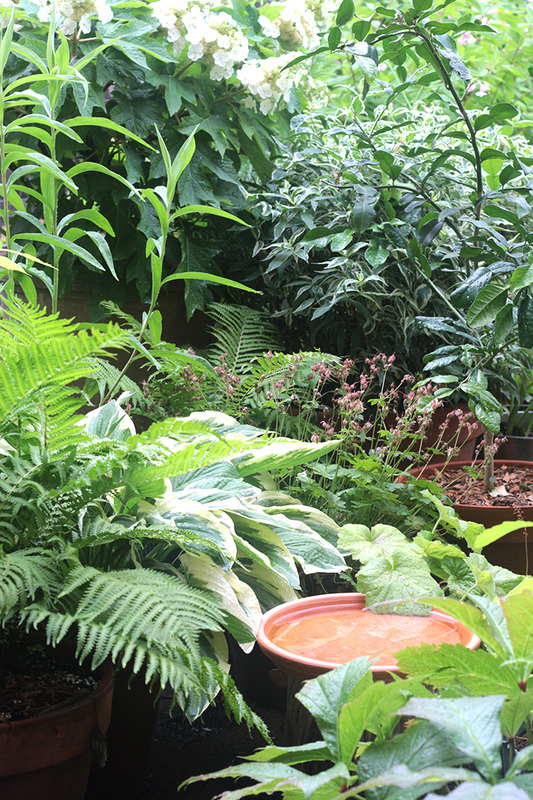 After I discovered a local cat in the garden I made a second birdbath nearer the house, between the ostrich ferns and the Rodgersia. The cat was staking out a more secluded one. Bad cat! 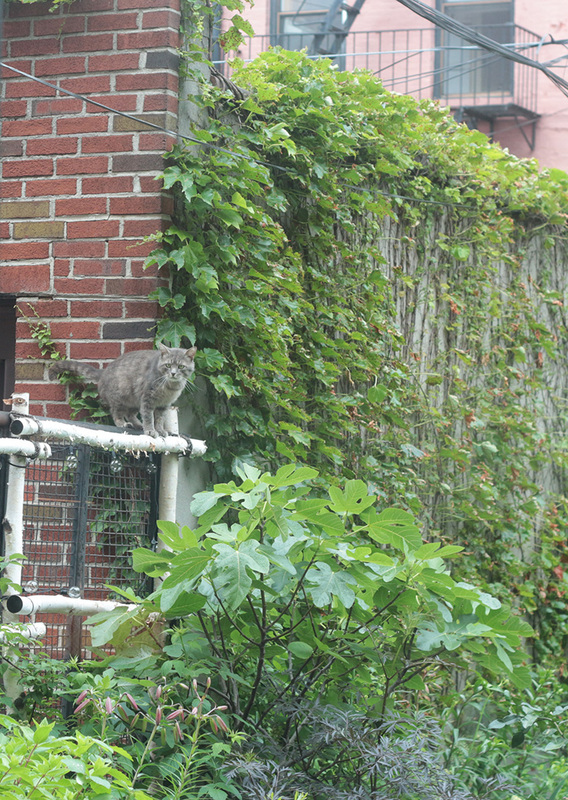 It climbed straight up and down the fence (I photographed it through the closed glass kitchen door). Yes, I miss having a cat of our own, very much. I spend a lot of time alone, and a cat companion is still my favourite kind. No, we may not have a cat. Them's the rules. End of story. So we watch for possums, instead. This side of the garden faces east, with direct sun in the mornings, and also gets some western sun, so I have packed a lot in. As common as they are the two hydrangeas that I bought after we moved here give me great pleasure. They are full, easy to look after, and bloom for a very long time, staggered over months. And they take both summer's blazing heat and the Deep Dark of Winter. The so-called peegee (Hydrangea paniculata) blooms later - I don't even see buds, yet. A late freeze in spring nailed some of my lily bulbs, which rotted after I had overwintered them carefully in peat-filled baggies in the fridge. 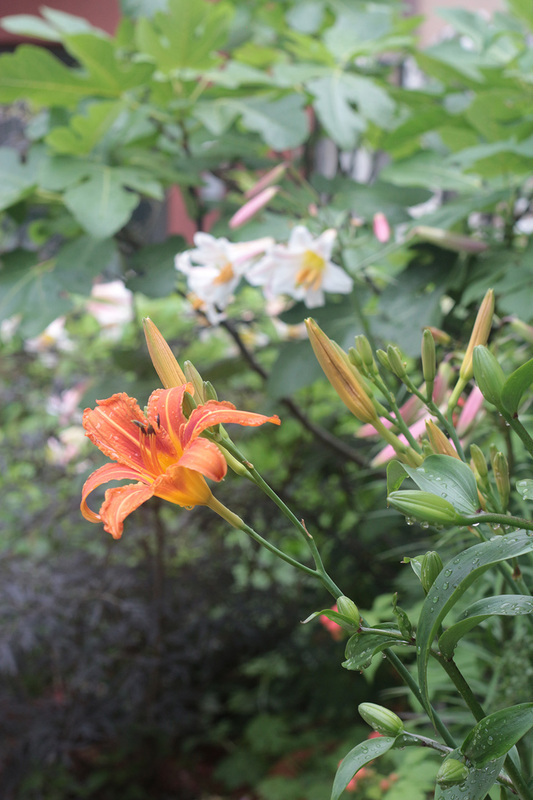 But some regal lilies escaped harm and are looking beautiful. At their feet are some South African bulbs - pineapple lily, or Eucomis. They will bloom in late July, I think. 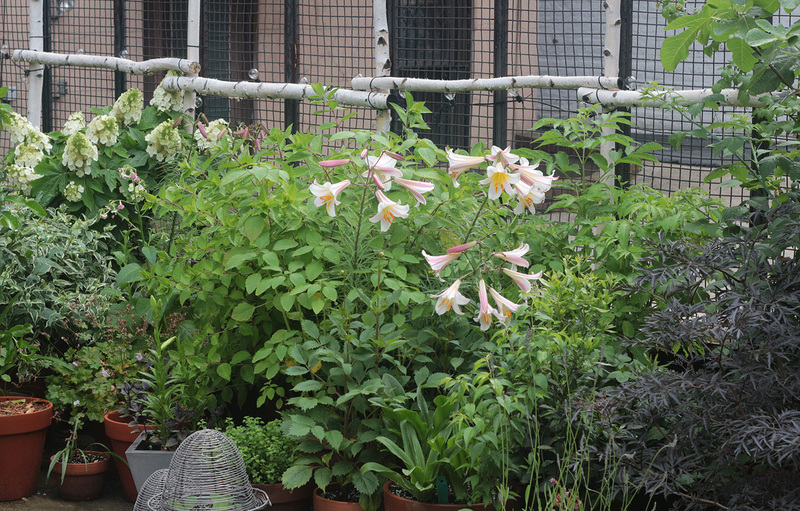 'Black Lace' elderflower on the right. 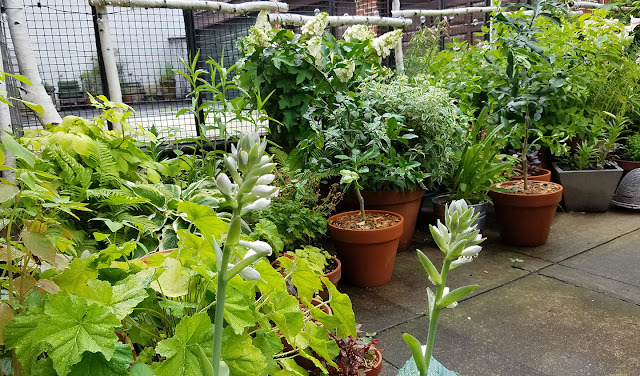 The fig (rear, above) that the Frenchman bought for me last year, and which the Gowanus Nursery very kindly delivered (it was very heavy) has fruit again - the main crop, on new growth. I am expecting a bird net to be delivered any day now, and then I will wrap it. I lost all the breba figs (on old wood) to some bird. or maybe the dang squirrel/s. The Nicotiana mutabilis from Annie's Annuals turned out to be mostly lime green, but two were correct. Annie's sent me a gift voucher for the balance to make up for it, after I sent them some pictures and explained what had happened. Very good customer service. In the meantime, many Nicotiana volunteers have germinated in pots, and I have transplanted some to see what they turn out to be. 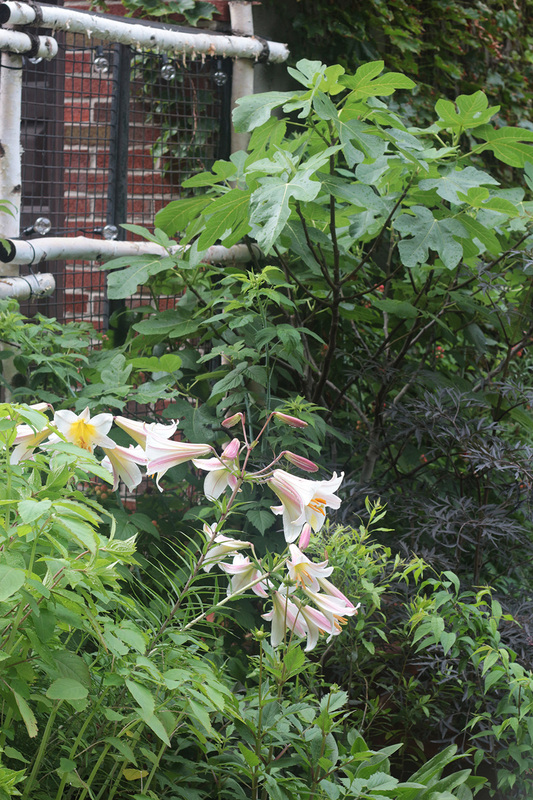 I have grown N. sylvestris, alatus and mutabilis before, and they could be any of those. Again, hopeful hummingbird buffet. 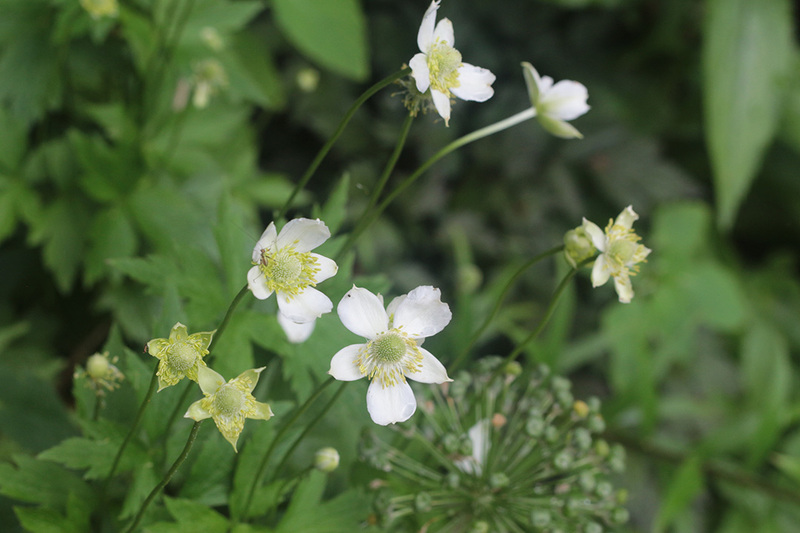 The lovely thimbleweed (Anemone virginiana) I planted the same fall that we moved in (2015). It has filled in nicely and has very tall threadlike stems and dancing flowers, each about an inch across. 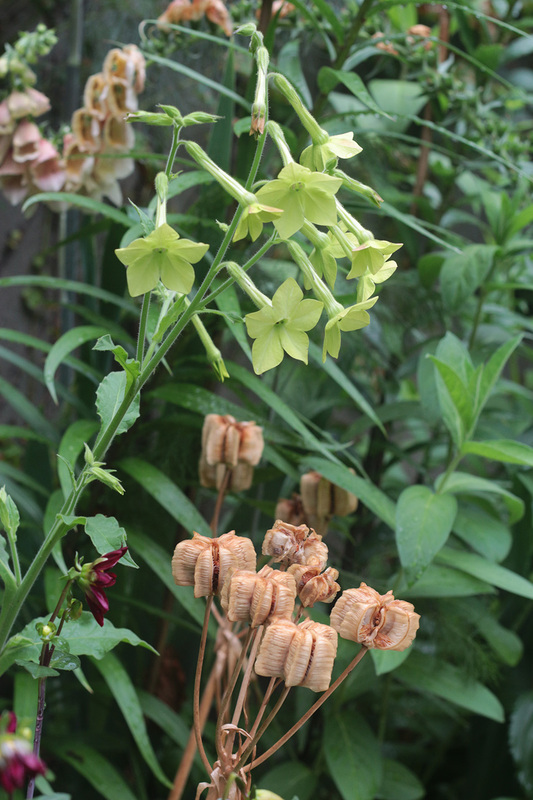 The chartreuse Nicotiana don't look bad - I do like them. Especially as a backdrop for the complicated seedpods of Fritillaria raddeana (the frittilarias were a big success in spring). 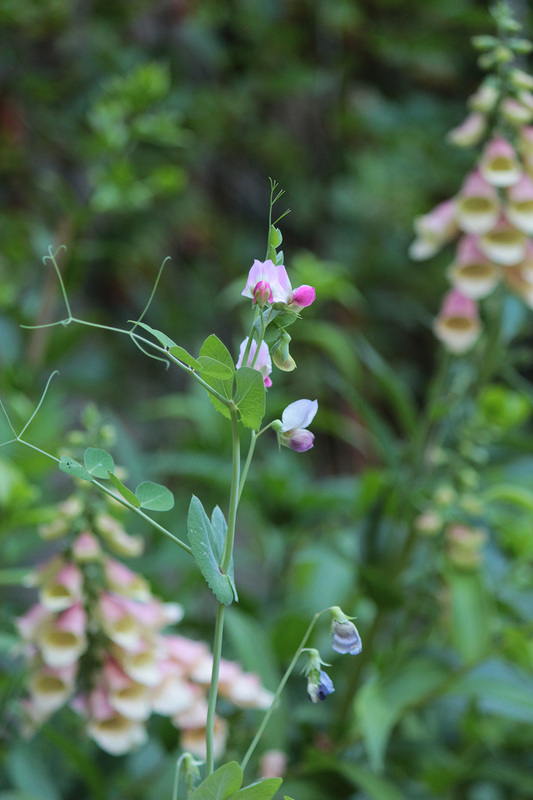 Some grey sugar peas made it into the perennial beds. They are exquisite. The foxgloves bloomed this year for the first time - I planted them last year, also from Annie's. Unpromisingly named 'Polkadot Pippa' but billed to be everblooming. I'll deadhead and let you know. And last, one of two perennials that predated our arrival - the ubiquitous day lily (Hemerocallis fulva), long limbed and useful to me because it is edible. And I love the flowers. I divided a massive clump and planted it in two spots. Next post? Fruits! Or maybe vegetables. Your garden is lovely. I'm sorry you can't have cat (I do miss your sweet kitty) as they make great companions both inside and out in the garden. I think mine is part dog...he follows us out, then follows us in, the out and loves to sit in any hole we dig. Wishing you future kitties! A cat sitting in holes is very funny. And cats are funny! Yes, I do miss cats. Oh joy! A full, delightful, joyous and informative garden blog post. Hooray! I cherish this post. 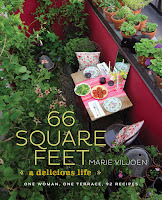 So so sorry that blogging takes last place these days, dear Marie. Whenever you feel like bumping blogging higher up on your massive to-do list, please know we are out here waiting, loyally anticipating. 99 deg. F here today; just waiting it out til a cool down on Friday. 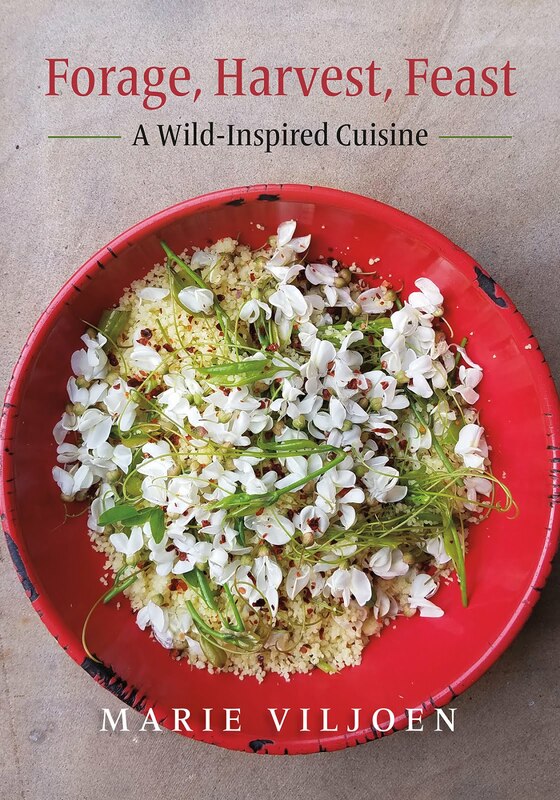 When the foraging book is done, hopefully there will be more time for some Blogging. Your hydrangeas flowers look like cones, here in France they are rather hemispheric, are they a different type? And what do you plan to grow on your wooden posts? This is Hydrangea quercifolia - oak leaf hydrangea.There are several species. Your round ones are either so called mopheads - Hydrangea macrophylla, or H. arborescens. Things are looking great. I continue in awe of how much you've done so quickly. Sounds like the book-work is coming along well, too. Day lilies are edible?! Holy cow! I have tons. What do you do with them? Ditto! That caught me eye, too. Going to look it up soon. Beautiful tour! I'm jealous of a few items, the hydrangea and nicotiana. 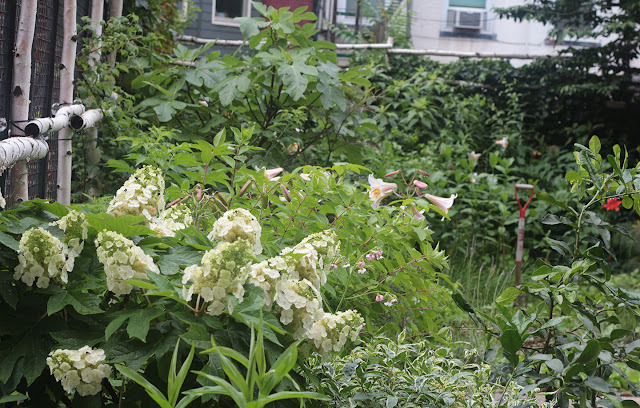 My hydrangeas are languishing and nicotiana are a favorite of the deer. I am very grateful we have no Brooklyn deer! Your garden is beautiful! And reading your blog brightens my day. Glad you squeezed this one in. 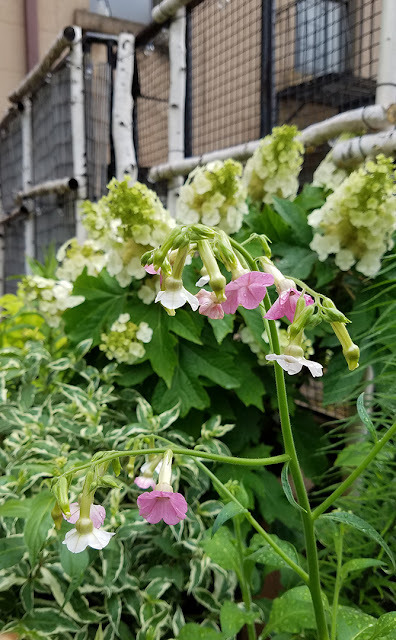 I got a Nicotiana mutabilis from Annie's Annuals as well two years ago and it did great and the colors were right but of its self-sown offspring the next year about half had lime green and dull brownish pink flowers. The genetics of that species must make for some variability. That is very interesting, thank you, Nic. I wonder if that contributes to the relative scarcity of the plants in the market place.